Clayson Benally and Jeneda Benally of Blackfire are excited to announce their new musical side project “Sihasin”! A Navajo word that means Hope and Assurance is the basis for the duo’s new sound. Bass and Drums with vocal harmonies giving way to Navajo singing and melody creates a duophonic energy that leaves you with a feeling of Get Up, Stand up, use your voice and DO! 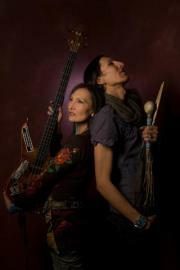 Their unique new sound continues the power and energy of resistance for environmental and social injustices. Brother and sister originally from Black Mesa on the Navajo Reservation in Arizona, were born into the heart of a political land dispute separating them by a fence from traditional homeland and family. They grew up protesting the environmental degradation and inhumane acts of cultural genocide against their traditional way of life.Their musical style encompasses many genres of music including rock, punk, folk, world. Jeneda and Clayson are at home on any stage. This entry was posted in Make No Bones Shows and tagged First Nations, First Peoples, Honoring, Indigenous, KAOS 89.3 FM, Make No Bones About It, Native American Indian, Sihasin. Bookmark the permalink.